When planting the mulch should be flat. Here, a well, was made with the soil, and then mulched. One problem with this practice is that the area inside the well gets the water. Its the same as being in a pot. The roots will grow in the area within the well leading to girdling roots. The root ball should be watered twice and then watering should be away from the tree. 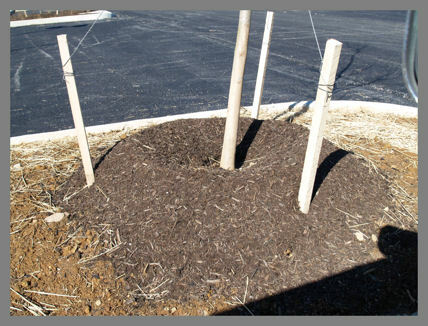 The mulch should then be flat and not in the shape of a well. mulch should also be kept at least 6" from trunk.